With the goal of harnessing the untapped potential of Iranian-Americans, and to build the capacity of the Iranian diaspora in effecting positive change in the U.S. and around the world, the West Asia Council has launched a series of interviews that explore the personal and professional backgrounds of prominent Iranian-Americans who have made seminal contributions to their fields of endeavor. Our latest interviewee is Farzaneh Roudi. 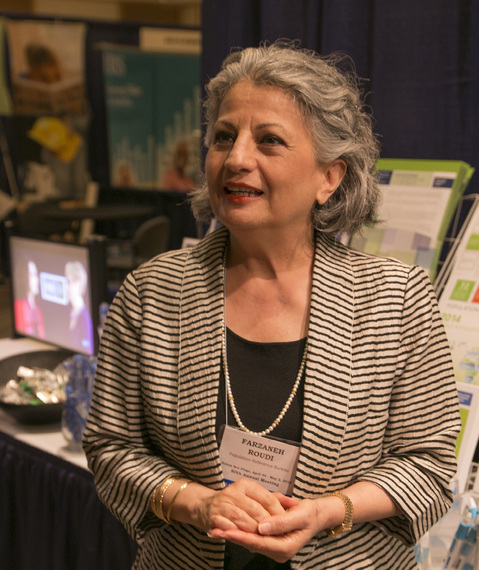 Farzaneh Roudi has been with the Population Reference Bureau since 1987 and serves as a senior policy analyst and founding Program Director for the Middle East and North Africa (MENA). Ms. Roudi has collaborated with different organizations from the Middle East region and is recognized as an authority on West Asia/Middle East population matters. She has lectured on these topics at the World Bank, academic institutions, and international conferences. She is author of a numerous reports and articles on Middle East population issues. In collaboration with colleagues, she has conducted training workshops on policy communications for researchers in the MENA region working in the area of population and development, to enhance their skills in communicating their findings to policy and program planners in the region and beyond. Ms. Roudi has an MA in demography from Georgetown University in Washington, DC, with additional graduate study in demography at the University of California in Berkeley. She received her BA in sociology from the National University in Iran. I was born in Shiraz and grew up in Tehran, Iran. My family moved to Tehran when I was nine years old. As far as I remember, there were always family members from Shiraz who lived with us (my parents and my five siblings) So, our household was quite large and vibrant. It was fun! We all understood that our education was a priority for my dad, who had a master's degree in civil engineering. I was the first among my siblings to come to the United States to go to graduate school, after receiving my B.A. from the National University in Tehran in 1974 in sociology. I settled in Washington, DC, and enrolled in an M.A. program in demography at Georgetown University. My attraction to the field of demography came naturally given its major place in the field of sociology, and the fact that I had completed high school in Tehran in the mathematics stream. After receiving my masters at Georgetown, I went back to Iran and worked for two years as a senior demographer at a research institution affiliated with the National Plan and Budget Organization. What I particularly enjoyed about my job was the field trips that we took to villages and small towns to conduct research on topics such as women and labor force participation and rural-to-urban migration. I moved back to the U.S. in 1979, settling in the San Francisco area where I continued my graduate studies in demography at the University of California at Berkeley. While a student there, I took a summer internship at the Population Reference Bureau (PRB) in Washington, DC, where I stayed for nearly 30 years and built my career in the field of population and development. In what ways do you help expose experts and the broader public to the lesser known sides of West Asia (aka Middle East)? I have always been surprised by the limits of knowledge in the U.S. about people in West Asia, despite the region's pivotal role in U.S. foreign policy and its regular coverage in the media. At PRB--whose mission is to inform people around the world about population, health, and the environment, and empower them to use that information to advance the well-being of current and future generations--I seized the opportunity to write about the Middle East and give presentations at international conferences, including the ones organized by the World Bank and the United Nations. I initiated PRB's Middle East and North Africa (MENA) program in 1991, with the goal of responding to the region's need for objective information and analysis on population and women's reproductive health, knowing that region's sensitivities on these issues demanded a targeted program. As Director of PRB's only regional program, I led the dissemination of the latest data and analyses on MENA's population and development by connecting to researchers in the region and producing user-friendly reports, as well as conducting training programs for local researchers to enhance their skills in communicating their research findings to policy audiences. The program proved to be unique and successful in helping fill the gaps between research and policy on population and development issues in MENA. The reports have been widely read and used beyond their intended audience in the region, including international organizations and the media. Your writings highlight the importance of interdisciplinary work in social policy. Can you elaborate on this concept? Demography is an interdisciplinary field. The demographic profile of a country or a region affects and is affected by a wide range of its social, economic, environmental, and political factors. In my work, I have largely focused on aspects of MENA countries' demography, dealing with women's reproductive health and rights and what they mean for their social and economic progress. In the 1990s, I generally framed my arguments around the Programme of Action of the 1994 UN International Conference on Population and Development (ICPD), a framework for slowing population growth and improving people's lives, that for the first time put women's reproductive health high on global agenda by calling for universal access to a full range of safe and reliable family planning methods and related reproductive health services. Since 2000, I have also regularly used arguments put forward in the UN Millennium Development Goals (MDGs), signed by 189 governments, committing to combating poverty, hunger, disease, illiteracy, environmental degradation, and discrimination against women. And now I use the 2015 UN Sustainable Development Goals (SDGs) that also call for universal access to quality reproductive health services and ending discrimination against girls and women. Using these international development tools has enriched my advocacy work on improving women's lives in the region. It has also helped lessen sensitivities on discussing women's reproductive health issues, making them less likely to be rejected as Western ideas--ideas such as ending harmful practices of female genital mutilation which is mainly practiced in North Africa and parts of Yemen, and early marriages which is practiced across the region, albeit in varying degrees. The MENA region has come a long way in expanding reproductive health services and improving the wellbeing of girls and women, but still it has a lot to do to catch up and uphold the spirits of these international agreements. The spread of HIV/AIDS in MENA helped reduce cultural sensitivities around conducting research on reproductive health issues beyond maternal health, but policies and programs have yet to benefit from such research. Unemployment rates among women in MENA countries are among the highest in the world despite the fact that the region has the lowest rate of female labor force participation among world's major regions. The low labor force participation is in part attributable to the region's cultural and patriarchal norms that discriminate against girls and women. To be sure, discrimination against girls and women is a major global issue. What makes MENA stand out is that in most of the countries the discrimination is codified into law, especially so in family law. Moreover, the region's oil economy, dominated by men, helps reinforce patriarchal norms and gender discrimination. I should also point to two other sensitive topics when it comes to discussing region's population and development. They relate to political demography of the region. One is the demographic battle that has been going on between Jewish Israelis and Palestinians, casting its shadow over the region. And the other is migration, especially issues pertaining to refugees and labor migrants. Studying these migration trends has its own challenges, considering how fluid and limited migration data are generally, in part because of their political nature. Could you please share with our reader some of your insights and research findings on population and gender issues in Iran? Iran surprised the world when the results of its 1996 census showed fertility rates had declined by more than half in 10 years, from 6.2 births per woman in 1986 to 2.5 births per woman in 1996--the fastest fertility decline experienced by any country ever. Between the 1976 and 1986 censuses, Iran's population increased from 34 million to nearly 50 million, with an average annual growth rate of 3.9 percent--one of the highest rates of population growth in the world--3.2 percent from natural increase and 0.7 percent from immigration. Different sectors of government, such as health, agriculture, and education found it increasingly difficult to accommodate the fast growing population. Some schools, for example, had to go on two or three shifts to accommodate newcomers. After the eight-year war with Iraq ended in 1988, the National Plan and Budget Organization alerted top government leaders of the rapid population growth as an obstacle to economic and social well being of the country. This effort led the government to adopt a national population policy to slow population growth and have the ministry of health and medical education take the lead in a public campaign about the need for a national family planning program. In December 1989, the program was officially inaugurated and began providing modern contraceptive methods free of charge to married couples across the country, helping women avoid unintended pregnancies. It is worth noting that Iran had a family planning program during Shah, which was dismantled in the first days of the 1979 revolution because of its connections with the royal family and USAID. The level and speed of Iran's fertility decline was beyond any expectation. The first official target of the family planning program, as reflected in the government's development plan, was to reduce the total fertility rate to 4.0 births per woman by 2011. By 2000, the rate was already half of the state goal, at 2.0 births per woman. What brought such a drastic change in the Iranian women's reproductive behavior was that numerous factors came together at the same time: First, Iran's primary health care system was developed enough to deliver family planning services across the country, including rural areas through its nationwide health centers and mobile clinics; and second, the government's commitment to remove economic and social barriers to accessing modern contraceptives happened at a time when women's education was rising rapidly and the desire for small family size was rising. Iran's internationally-recognized rural health care network was key in getting modern family planning methods to couples living in rural areas. In only one generation, the fertility rate in rural areas dropped by three-quarters, from 8.1 births per woman in mid 1970s to 2.1 births per woman in 2006. To put this into perspective, it took about 300 years for European countries to experience a similar decline. Your most recent work has focused on Egypt and Iran. What are the major similarities and differences between demographic trends in these two countries? Both countries are heirs to ancient civilizations and have a well-defined sense of national identity. Prior to the Iranian revolution, political relations between the two countries were very close. Over the past few decades, however, with the changing geopolitics of the region, relations have been far less steady. The greatest similarity is that both countries have much unmet potential. I have made dozens of working trips to Egypt and am very fond of the personal and professional relationships I have developed there. In 1990, Egypt and Iran had a similar population size--56 million, according to the UN Population Division. Because of its higher fertility level, Iran had a younger population; the median age in Iran was 17, and 20 in Egypt. Then, Iran's fertility rate declined rapidly, but not so in Egypt. As a result, by 2015, Egypt's population reached to nearly 92 million--11 million more than Iran's. The latest demographic and health surveys in Egypt show that women, on average, have 3.5 births, a rate similar to what it was in the late 1990s. Today, not only does Egypt have a larger population, but its population is younger, giving further momentum to its population growth. Half of Egypt's population is below age 25, which means that in the next 25 years or so they are going to have children, if they haven't done so by now. The median age in Iran is 30 and it is expected to rise to 38 by 2030, while Egypt's median age is expected to rise by only 1 year, rising to 26. Population pressure on Egypt's fragile economy is enormous and evident, increasingly pushing people into poverty. The government recognizes the problem, but whether it succeeds in reigning in the rapid population growth remain to be seen. Different international development agencies have been supporting Egypt by funding social and economic programs, seeing it as a country that's "too big to fall." If current trends continue, by 2030, Egypt's population is expected to reach 117 million--28 million more than Iran's. It is worth mentioning two other demographic trends that are influencing the overall fertility behavior of women in these two countries. Today, almost three-quarters of Iran's population live in urban areas; in Egypt, the majority of the population live in rural areas where traditional customs are stronger, such as early marriage and childbearing. Both countries have a large number of their people who live abroad. The Egyptians abroad largely live in the GCC counties, and Iranians abroad mostly live in Europe, North America, and Australia. The Egyptian migrants are disproportionately male and tend to bring back home conservative ideas from their host countries, while the Iranian migrants, who are about equally male and female, have the potential to transmit more liberal values to masses in their country of origin.